We decided to hand over the second D1 driver's personal column space to the manager of the Ebisu Circuit, (A.K.A. The holy land of drifting) Nobushige Kumakubo. Let's see how the captain of Team Orange spends his daily life. Hello! My name is Nobushige Kumakubo and I am the owner of the Ebisu Circuit, and I also professionally drift for a living. Today, I'll be providing some insight into my past as well as my current professions. I'll try to make it as interesting as possible! A lot of people assume that since I work at Ebisu Circuit, I must drift all day, everyday. They are greatly mistaken; the only time I practice on my track is if there are any big changes made to my D1 vehicle. I can say that hardly ever practice here at all. Even when there are changes to my machine, the most I ever practice is about ten minutes or less. Strange isn't it?! I found myself working at Ebisu Circuit after I graduated from college and until then, I had never tried drifting a car. At the time, I never understood why people enjoyed drifting. But one night after my shift, I observed one of the staff members drifting his car on the track. It sparked a small interest inside of me and I decided to give it a try. The first time I tried it, I somehow successfully executed a drift. That was where it all started. I think I was able to drift for the first time all because of the dirt track racing I had been witnessing since I was a little kid. I also remember that whenever I used to play with toy cars, I would slide out the rear of the vehicle just the way the dirt oval machines moved. All my life, it was normal for me to believe that a car slides sideways. The story jumps to when I was five. Here, I experienced for the first time the thrill of riding a motorcycle and I was completely hooked. At 3rd grade, with all seriousness I started riding motocross. Ebisu Circuit was used as a vehicle testing grounds by Nissan back then, so legendary figures such as Mr. Hoshino and Mr. Hasemi were always around to teach me how to ride. Way back then, these guys were still developing their careers. But now, they are well established legends in the racing world. I was able to call them directly by their names since I was a kid but now out of respect, that is out of the question. My passion for motocross started to explode. 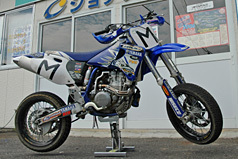 By my late teen years, I was one of the best motocross riders in Japan. Unfortunately everything changed when I was badly injured at 20. I was ready to devote my whole life to riding motorcycles until that incident. I had been riding all my life and it will be part of me even while I'm competing inside an automobile. Lately, I have been riding my Yamaha YZF426 around the tracks here. We decided to build a dirt ramp and it's been so much fun! I just have to be careful not to injure myself. So there you have it, now you know that my passion for motorsport is very broad, ranging from 2 to 4 wheels! Do you know why everyone around me calls me "the manager" instead of my name? It's because my primary profession is to manage the Ebisu Circuit. I do run this place, but I also like to be involved in the design of the track. In order to build a race track that applies to the current era of motorsports, I travel all over the world to research a variety of circuits! So whenever I personally race on different courses for D1, I tend to rate the overall layout of the track. Such factors as the slant of the course and the materials used for the surface are never overlooked by my eyes. In order to provide our enthusiasts the most entertaining and a challenging track layout, each place has to be researched and dissected. However, in order to keep our race track from becoming just my ideal design, input from others are highly necessary as well. We take any comments from the local racers very seriously in regards to course preference. Coordinating events is another important duty. Associating myself with various motorsports events to try to come up with a good idea for an event, I found myself coming up with the best ideas when I play pachinko (Japanese slot machines). I thought up the motorcycle and drift fused event called the Big X while I was playing pachinko too. These pachinko parlors give me the opportunity to spend time alone with my thoughts, unbothered. I never go there to actually try and win money, but to get new ideas in my head. I have been going to these pachinko parlors recently, but no new ideas yet. I will see to it that Ebisu Circuit will be fully catering to the enthusiasts' needs and will be the best place to experience motorsports in the future. Please keep your eyes open as we will introduce more and more unique events to the public! Like always and from now on, we're going all out! My number one dream right now is to expand past Japan and hold events overseas in different countries. In order to do so, I'm constantly brainstorming for new ideas to entertain the crowd. As the manager of the Ebisu Circuit I want to create an event that has never been done before that everyone can enjoy watching. With all this said, I still have my responsibilities and drive to succeed as a D1 driver, so please support Team Orange! 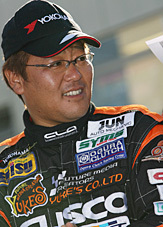 Kumakubo has been participating ever since the premiere of the D1 Grand Prix. He is known for his super-human tsuiso (chase) drifting techniques. In 2006 he is planning to compete in the YUKE'S GDB Impreza. 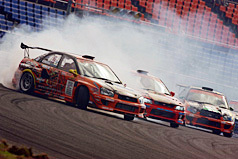 Currently, the Team Orange members consist of 3 drivers; Nobushige Kumakubo, Kazuhiro Tanaka, and Naoto Suenaga. The Team Orange name came to existence when coincidentally everyone in their team had orange vehicles. Kumakubo had always had a passion for bikes ever since childhood. He currently enjoys riding his Yamaha YZF426 jumping and sliding the machine around. Kumakubo also takes pride in the design and layout of the race track. 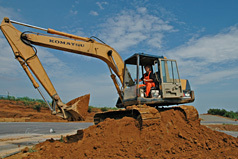 He personally gets his hands dirty operating heavy machinery, dedicating his life to this place. Ebisu Circuit also contains a zoo named the "Touhoku Safari Park". 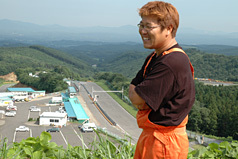 Kumakubo states that he often comes up here to relax and overlook the track whenever he has time.